The foam inductors are designed to feed foam concentrates at a set mixing rate into the hose line. Inductors are placed in the delivery line between the pump and the foam nozzle and can be used for medium and also for heavy foam nozzles. The venture system creates a vacuum in the body of the inductor and the foam concentrate is picked up via a suction hose ND 10 with a Storz D 25 coupling. At the foam inlet Storz D 25 adapters are generally mounted. A mixing rate between 0% and 6% is possible. AWG-Foam inductors are also available with an individual foam pickup rate (AWG Z-Select) on request. Inductors supply liquid foam concentrates of a certain admixing rate to the hose. For small rates of wetting agents, between 0.1% , 0.5% , and 1%. Especially in combination with hollow stream nozzles. They are installed in the hose line between the pump and the foam nozzle and can be used with both medium and heavy foam nozzles. The AWG Z-Select is an attachment for the regular inductor of Z2 or Z4, in order to make the dosing in smaller rates can be acurately achieved. Adding wetting agents to the extinguishing water reduces the surface tension of the water considerably and therefore increases the extinguishing effect. The Z-Select works in every installation position just like an inductor in accordance with DIN 14 384. A fitted spring-lladed return valve prevents the water running back into the foam concentrate tank. The working principle and properties of the inductor Z2 or Z4 are not impaired by the dosing attachment. When using medium to heavy foam and admixing rates of 3-6%, medium to heavy foam hoses M2, M4 and/or S2, S4 are usually used (flow rate 200 and/or 400 l/min at 5 bar on the foam nozzle). Therefore when using wetting agents with admixing rates of 0.1% and 0.5% and hollow stream nozzles, the flow rates at Z2 need to be at least 200 l/min and Z4 at least 400 l/min (e.g. Turbo Nozzle 2235 setting 235 l/min, Turbo Nozzle 2400 setting 400 l/min). Similiar to all units that work with foam concentartes, the dosing attachment needs to be cleaned thoroughly – and rinsed with water whilst switching through all the setting points. Also it can be easily dismantled and reassembled using standard tools. Readjustments are not necessary. 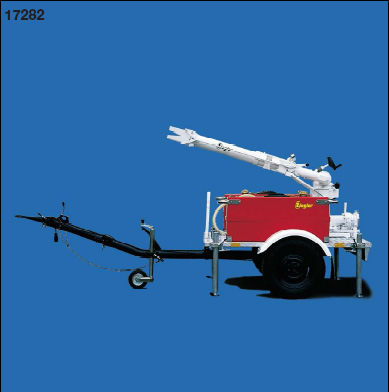 The Z-Select can of course be coupled into the foam feed line between two D-suction hoses. The Turbo-Type Foam Liquid Admixer TR 400 is used for the generation of a foam liquid / extinguishing water mixture. Foam liquid and wetting agents are added via a pump at a quantity ratio between 0,5% up to 6% to the extinguishing water. The pump operates with a turbine driven by the extinguishing water. Connected to the 3” (B) pressure outlet of the fire engine. This system works with far less pressure loss compared with conventional foam inductors based on a venture system and also allows additionally the use of polymeric, viscous foam liquids. Foam liquid inlet is fitted with Storz System 25=D adapters. 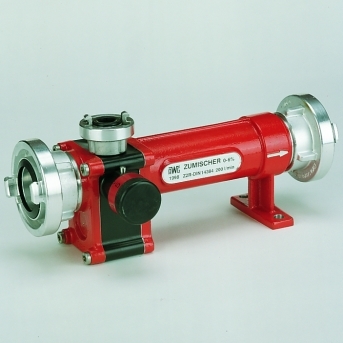 As an alternative for low dosing of 0,1% – 1% the Turbotype foam admixer TR 400 N can be used.